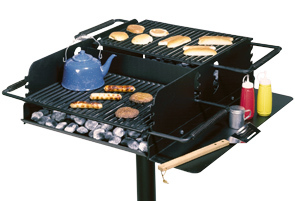 Belson's patented TWIN SIZE CHAR-WOOD® grill is a combination of two large cooking grates back to back. Each grate functions independently of the other and adjusts to four different cooking heights. A special swivel and locking device prevents theft. Swivel mechanism allows 360° rotation for wind draft control. Overall size: 24" x 36".